Now that fall is officially here, and the weather in northern West Virginia is cool and rainy, I've decided to embrace all things comfort food! HOWEVER, I do think there's balance between naughty and nice when it comes to hearty meals. 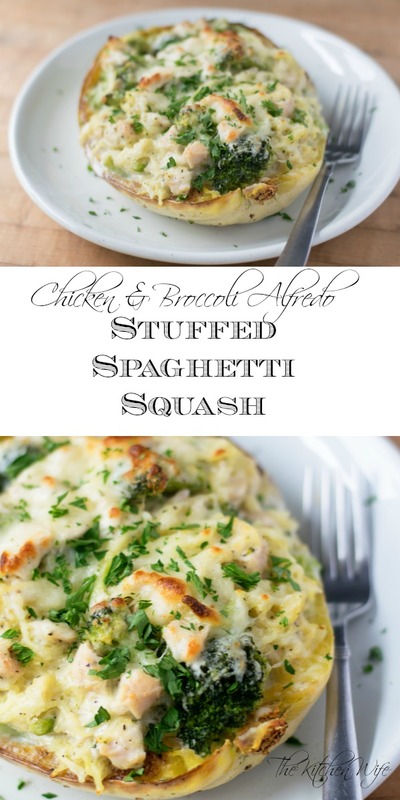 This Chicken & Broccoli Alfredo Stuffed Spaghetti Squash Recipe is the perfect example of that! After that, you'll need to CAREFULLY cut your spaghetti squash and half, lengthwise, and scoop out the seeds and stringy bits with a spoon. I forgot to take a picture of this, but place the squash, cut-side up, along with the chicken on a baking sheet and drizzle with the oil. After that, you will combine all the spices into a bowl and season the chicken and the squash. DO NOT USE ALL THE SEASONING BLEND. You will need it for the rest of the dish as well. While the chicken and squash are roasting you can make the alfredo sauce. Before you ask, YES you can use jarred sauce, but I'm just not a fan and it is SO easy to make yourself. Pour the heavy cream into a sauce pan. Add a tsp of the seasoning blend to the pan as well. You will whisk in the grated Parmesan. Whisk, whisk, whisk until the cheese has melted and the sauce is thick and creamy. After 30 minutes remove the squash and chicken from the oven. You will need to shred or chop up your chicken. Then place the steamed broccoli into a large mixing bowl and add the rest of the seasoning. Pro tip, I buy the steamable bags and nuke them as a time saver! The squash should be cool now so take a fork and break up the squash into "pasta" like pieces. Scoop the shredded squash into the mixing bowl. OMG...I wish you could experience how good this smell right now. Now scoop the filling between the two shells of the squash. Top with the rest off the cheese and pop back into the oven for another 10-15 minutes to let the cheese melt and get bubbly and brown. And there you have it! 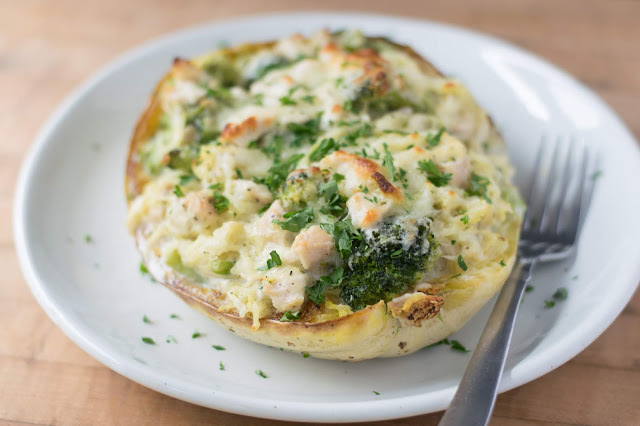 This stunning Chicken and Broccoli Alfredo Stuffed Spaghetti Squash is a little naughty, a little nice, but all delicious. It's so flavorful and filling you honestly won't that there's no pasta in this dish, and what a great way to get those kiddos to eat their veggies! I see this being a go-to meal for us this fall season and I know you're family is going to love it too so get in the kitchen and give it a try TONIGHT! Cut the spaghetti squash in half and scoop the seeds and stringy bits out with a spoon and discard. 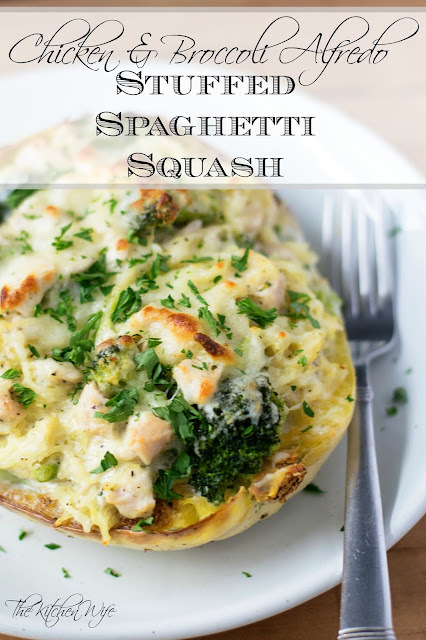 Place the spaghetti squash cut-side-up on a baking dish with the chicken. Drizzle the squash and chicken with the olive oil. Combine the salt, pepper, onion powder, garlic powder, and Italian seasoning in a bowl. Sprinkle some of the seasoning blend over the squash and the chicken. Flip the squash cut-side-down and place in the oven for 30 minutes. Pour the cream into a sauce pan and add 1 tsp of the seasoning mixture to it . Place over MEDIUM/HIGH heat and let some to a simmer. When the cream starts to bubble around the edges add the grated parmesan and whisk until the cheese melts and the sauce thickens. Once the squash and chicken have finished roasting, remove them from the oven and allow to cool for 10 minutes. Once the chicken has cooled you will need to chop it. In a mixing bowl add the steamed broccoli (I steam in the microwave), chopped chicken, 3/4c shredded cheese, and the sauce along with the rest of the spice blend. Take a fork and break up the flesh of the spaghetti squash until it looks like "pasta". Add the spaghetti squash to the mixing bowl and stir everything together. Scoop the filling between the two spaghetti squash shells and add the rest of the cheese on top. Return to the oven for 15 more minutes.